Atlantic Starr was among the top urban contemporary acts of the ’80s and fared well in the adult contemporary market as well, but their roots were ’70s soul and funk. The East Coast outfit was formed in White Plains, NY, in 1976 by three brothers: lead singer/guitarist David Lewis, lead singer/keyboardist Wayne Lewis, and trombonist/percussionist Jonathan Lewis. After the Lewis Brothers hired lead singer Sharon Bryant, trumpeter William Sudderth, saxophonist Damon Rentie (who was replaced by Koran Daniels in 1981), bassist Clifford Archer, drummer Porter Carroll, Jr., and percussionist/flutist Joseph Phillips, Atlantic Starr’s original nine-person lineup was in place. Influenced by ’70s funk/soul bands like Earth, Wind & Fire, the Commodores, New Birth, and L.T.D., Atlantic Starr started playing around the northeastern U.S. They had only been together for about two years when they signed with A&M and started working with Bobby Eli, a well-respected producer/songwriter from Philadelphia. Produced by Eli in 1978, Atlantic Starr’s self-titled debut album wasn’t a mega-platinum blockbuster but did reasonably well and contained the funk hit “Stand Up” (which made it to number 16 on Billboard’s R&B singles chart). Eli went on to produce the band’s second album, Straight to the Point; while that 1979 release did OK, A&M knew that Atlantic Starr could be bigger. So in 1981, the band changed producers and enlisted James Carmichael for their third album, Radiance. It was a wise move; Radiance and its hit single “When Love Calls” established Atlantic Starr as a supergroup in the R&B market. It was on Radiance that the charismatic Bryant (who was featured on “When Love Calls”) really blossomed as a singer and her lead vocals played a major role in the band’s success. Carmichael went on to produce 1982′s “Brilliance” (which contained the number two R&B single “Circles”) and 1983′s Yours Forever; the latter includes “Touch a Four Leaf Clover,” another major hit featuring Bryant. Although Bryant was never Atlantic Starr’s only lead singer — Wayne and David Lewis also provided their share of lead vocals — she was a major asset. So it came as quite a disappointment when she left Atlantic Starr in 1984 to pursue a solo career. But all was not lost. The talented Barbara Weathers was hired as a replacement and 1985′s As the Band Turns — Atlantic Starr’s first post-Bryant album and sixth album overall — found the outfit unveiling a smaller lineup that consisted of Weathers, the Lewis Brothers, and Phillips. 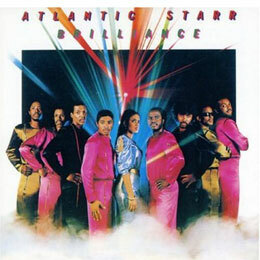 Sudderth, Daniels, Archer, and Carroll were all gone, but despite those personnel changes, Atlantic Starr was still distinctive and recognizable. As the Band Turns, which contained the major hit “Secret Lovers,” turned out to be Atlantic Starr’s last album for A&M; in 1987, they moved to Warner Bros. and fared well with the album All in the Name of Love and the smash hit “Always.” A syrupy adult contemporary ballad, “Always” reflected the Lewis Brothers’ desire to have the type of crossover success that Whitney Houston and Lionel Ritchie had been enjoying in the ’80s; they got their wish when “Always” soared to number one on both the pop and R&B charts. After All in the Name of Love, Weathers left the band to pursue a solo career and was replaced by Porscha Martin, who was featured on 1988′s We’re Movin’ Up. Martin was around for a few years before being replaced by Rachel Oliver (Atlantic Starr’s fourth female vocalist) in the early ’90s. Atlantic Starr’s relationship with Warner Bros. ended after 1991′s Love Crazy, and in 1994, the band recorded one album for Arista: Time. That album was a commercial disappointment and the single “I’ll Remember You” only made it to the fifties on Billboard’s R&B and pop singles charts. Time (which was David Lewis’ last album with the band) found a fifth female singer, Aisha Tanner, replacing Oliver. And when 1999′s Legacy was distributed by the small, independent Street Solid label, Atlantic Starr unveiled yet another lineup — one that consisted of two Lewis Brothers (Wayne and Jonathan) as well as Oliver (who had returned and replaced Tanner) and a new male singer named DeWayne Woods. Although Legacy received very little attention, Atlantic Starr hung in there and was still performing for die-hard fans when the 21st century arrived.